In my house one of our favorite ways to spend time together as a family is through family game night! We love surrounding the table, picking out some board games, and playing for hours! Since we have played some of our games so many times my daughter absolutely loves when we get new ones to add to our collection. We recently received three board games from Goliath Games and love them! 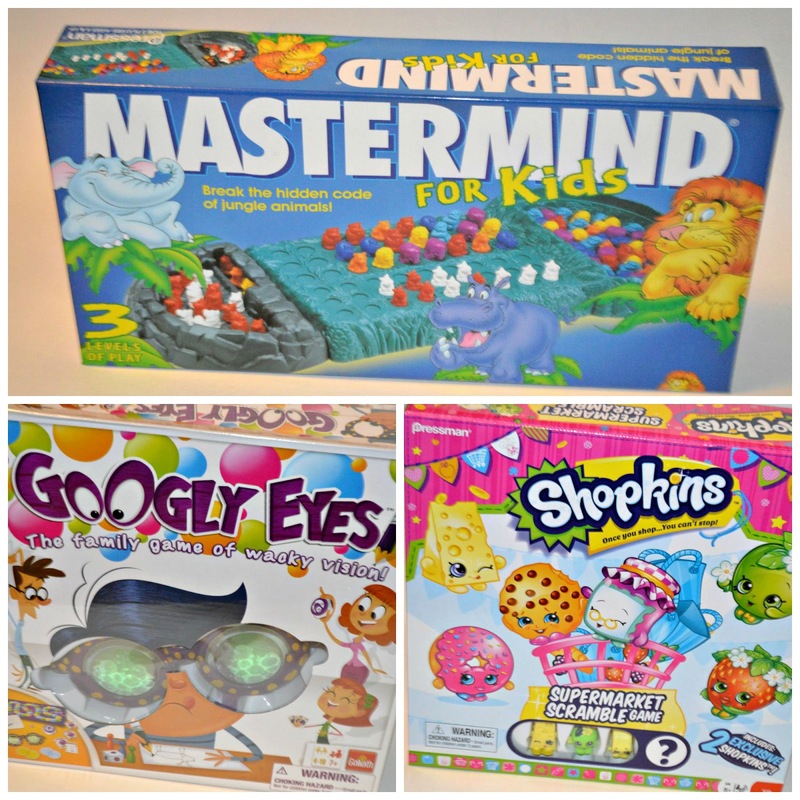 The games that we received are Mastermind for Kids, Googly Eyes, and the Shopkins Supermarket Scramble Game! Since receiving them we have played countless times and they have quickly become family favorites! Anyone with a child in elementary school has probably heard of Shopkins. These little toys have become a huge hit with girls and boys alike. The second that I opened up our box from Goliath Games my daughter saw the Supermarket Scramble game and needed to play! It is a really cute game where you go around the Supermarket picking up Shopkins tiles in different departments. But be careful because you will face obstacles along the way! Googly Eyes is the fun game of wacky vision! In this game you put different lenses into your glasses and try to draw what your card tells you to while the others you are playing with try to guess what you are drawing. Sometimes you even have to do things like drawing with your opposite hand! Googly Eyes is such a fun game for all ages. My husband and I enjoyed playing it just as much as Mia did! We have played this game over and over again since receiving it! 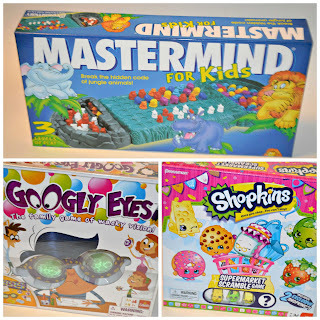 If your children enjoy logic and deduction games than Mastermind for Kids is perfect for them! This two player game is a game of code-cracking fun! One player makes a code and hides it under the rock tray. Once the code maker is ready the other player tries to crack the code in as few turns as possible by using red and white pieces to guess. My husband loved playing this game with my daughter. They had so much fun trying to crack each other's codes! If you are looking for new board games for family game nights you definitely need to check out Goliath Games! They have fun games for a variety of ages! Visit the Goliath Games website HERE! We got some games from Goliath Games last year and they were a hit with my daughter. She might be a bit too young for Shopkins but I'm sure she'll love it! The game can be played in workout mode, story mode, lesson mode or kids mode. This rhythmic game is the best one until now, because all the previous titles didn't include the Wii Balance Board. It includes also more than 50 tracks of music. Truly an online gamble is an advantage and a unique way to enjoy the excitement of betting for the winning team. visit this website for more information about bitcoin..
therefore, gaming peripherals are the best gaming devices which comfort the gamers who love to play the ideal games with easy and accessible device to play their skills.